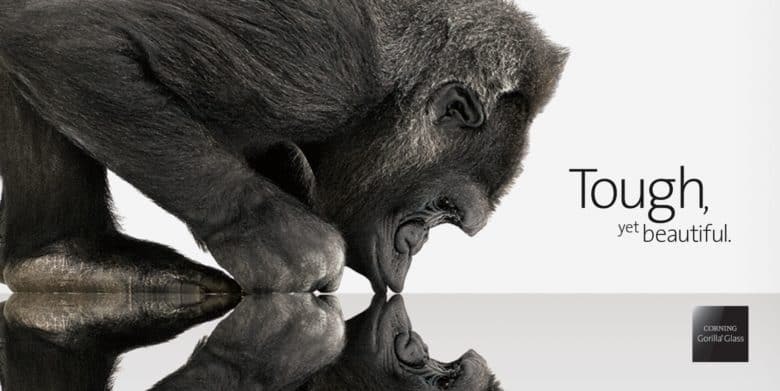 Corning's Gorilla Glass 6 can survive being dropped over a dozen times. Ape not included. Earlier versions of Gorilla Glass have been used on all previous iPhone models since Steve Jobs chose the company to provide screen covers in 2006. Apple prefers not to disclose which companies provide components for its devices. And Corning didn’t say that the next-generation iPhone and iPad will use Gorilla Glass 6, but it’s a fairly safe bet. And not just Apple. Corning’s screen covers have been designed into more than 6 billion devices from over 45 major brands. To be clear, a screen cover is built into the device. It sits over and protects the touchscreen and LCD underneath. It’s not the same as a removable screen protector. “Corning Gorilla Glass 6 improves upon Gorilla Glass 5 by surviving drops from higher heights, but, more importantly, has been engineered to survive multiple drops,” said John Bayne, VP and general manager, Corning Gorilla Glass, in a statement. The material survived an average of 15 drops of 3.3 feet (1m) in Corning’s testing. Its maker says the new formulation is two times better than Gorilla Glass 5. Other benefits include optical clarity, touch sensitivity, and scratch resistance. Corning says the first products with Gorilla Glass 6 are expected to reach the market in the next several months. That’s about the time the new 6.5-inch, 61.-inch, and 5.8-inch iPhone models will debut.